Last week at 3:00am, I sat straight up in bed and muttered the name “Jamal Khashoggi.” I do not watch the news. I was by no means following the story. 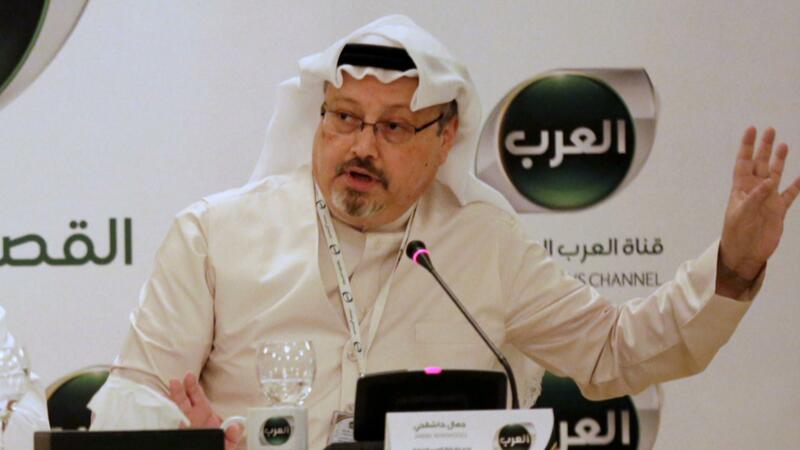 Had you asked me the name of the journalist who was murdered in the Saudi consulate I would not have been able to tell you. And yet, there it was on my lips: Jamal Khashoggi. It took me a moment to figure out why I was suddenly thinking about a journalist from another country being murdered in a horrific way. And then it struck me: His story is inherently Biblical. I am thinking here of the dismembered concubine in the Book of Judges. This is not a story that we hear in the pulpit very often. A helpless individual is beaten horribly and cut into pieces. It is the stuff of nightmares. Or the stuff of Scripture. Or, it turns out, it is the way Jamal Khashoggi was murdered. When her master got up in the morning and opened the door of the house and stepped out to continue on his way, there lay his concubine, fallen in the doorway of the house, with her hands on the threshold. He said to her, “Get up; let’s go.” But there was no answer. Then the man put her on his donkey and set out for home. The brutal similarities between Khashoggi and the woman in Judges are startling. But it would take another few days and an article about the Holocaust for me to understand the correlation. Both acts feel calculated and well organized. And so often, this is how evil shows its face. So much of this is things that we already know. Millions of seemingly “good” people turned a blind eye to millions of Jewish people being annihilated. But what captured me in this quote is that evil is actually quite well organized. That it actually requires an administrative structure. All too often we call evil “chaotic” and “random” because it is scary. But in truth, real evil is neither of those things. True evil calculates a person’s worth and then exacts its own sentence on human life. True evil has deep administrative roots. Roots that can lean on that adage that they are just doing their job. And while I find this thought overwhelming and full of despair, I have come to believe that if evil is working away at the devil’s instructions, then our God must be one hell of a chaotic mess. Because the last thing I would ever call Jesus is organized. It turns out that the Savior of the world was an organizational disaster. He picked fishermen to be his first recruits and then followed that up with a hoard of mismatched ne’er-do-wells. When the people are appalled at a prostitute washing his feet with oil, he speaks love over her. When people wish to hold back children from his presence, he tells those people to get out of the way. And when people challenged his power, he responded in cruciform. This is the very unorganized leader who redeemed us. He loves concubines, toddlers at border crossings, and journalists who risk their lives to tell the story of impossibly well organized horrors. He loves all of us. And it feels especially necessary to say that He loves them. Advent is the right time for the asking of hard questions. Advent comes to a climax, not only on Christmas Day but also in the massacre of the innocents by Herod. The church has historically observed the Feast of the Holy Innocents on December 27, a remarkable conjecture that remembers a massacre of infants in the same season we rejoice in the birth of Christ. The great theme of Advent is hope, but it is not tolerable to speak of hope unless we are willing to look squarely at the overwhelming presence of evil in our world. Malevolent, disproportionate evil is a profound threat to Christian faith. It turns out that Advent is the right time to ask hard questions. I do not claim to have any real answers. Most days (and nights), I feel only questions of despair and the word that God puts on my heart. But if it feels as though the darkness is winning, I tell you to fear not. We do not worship an organized God. We worship an indiscriminately loving God. And this is Good News. There is a reason that the narrative of Christ coming into the world is told just before we see the calculated evil of Herod. The well oiled machine of destruction meets the outlandishly risky love of a God-child in a manger. And the darkness did not overcome it. Powerful, Sarah. And much needed today. The music at the end hit me hard. Thank you. WOW WOW WOW. SO GOOD, SC! Love and order are not antithetical. I think all of the Reformers saw God as perfectly and completely both. Jesus after all feed the 5,000 in a very orderly fashion, to give one of many examples. Of course “organization” can be used for evil, but chaos can and often is as well, just ask anyone who grew up in an extremely chaotic home with no sense of security and loving order. I think this may be a sensibility missed by many readers here, a number of whom grew up in relatively privileged and orderly circumstances. Of course those “orderly” “privileged “circumstances can sometimes feel oppressive with demand and expectations, as is expressed frequently here. Excellent and a reminder that we should speak up when evil tries to come in through “proper channels”. It is true Sarah, every Nebuchadnezzar has his Daniel. Working along using his God given gifts to do the work of evil men even as he sought to do the will of the Lord God. I’m reminded of another Babylonian, General Georges Sada, who served in Saddam Hussein’s Air Force. On the night the United States launched its Shock and Awe attack he was in one of the bunkers receiving much of the US ordinance. He considered it a miracle that he survived. I remember that night praying for the safety of the bombers. While my Christian brother prayed to the same God for safety from our bombs. I say all that to say this. God isn’t disorganized. He just stands in a different place. From where he stands the Daniels, and Nebuchadnezzar’s, and Sadas as well as the evil doers and speak-out-against-evileers are all the same. We build our idols, lob our bombs, and words at each other then look to God for approval. Administrative order is evil’s substitute for its inability to copy the Incarnation. No amount of administrative ordering by evil can match or come anywhere near the supernatural order of the Incarnation of Christ, and then again his Resurrection. It is a depth of order that evil can neither perceive or emulate, because it is creative order. To quote a former president: a”There you go again”! Wonderful writing…again, Sarah! I am so glad we are in Houston so I receive your writing quicker! Incredibly, Sarah, you made me laugh out loud and cry. I think you got to my Christmas spirit AND introduced me to a new Bible story. Thanks, friend! The devil’s organization is a pretense of order because there is no peace. 1Corinthians 14:33 says –For God is not a God of disorder but of peace.